The Goodyear Eagle F1 GS tire provides high performance to go along with good looks for drivers who want a tire that handles well on wet or dry roads. 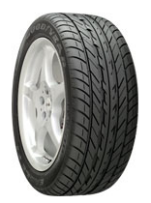 This high performance summer driving tire has an aggressive directional tread design and some nice features as well. The AAtrax tread compound is an advanced Goodyear technology that gives this tire its enhanced dry pavement grip. On the flipside, wet driving is improved through the use of Dual Aquachannel grooves all around the tire to aid in evacuating water from under the tread. Two steel belts that are reinforced with nylon around them help give the tire much better strength and durability. The one thing to keep in mind with this tire is to not attempt driving on it when the temperatures get down to freezing. It is definitely not a tire to use in the snow. Prices on the Goodyear Eagle F1 GS range from around $280 for the 17 inch series tire to approximately $325 on the larger 18 inch series model. Who Are Goodyear Eagle F1 GS Tires Designed For? As you would expect, Goodyear has designed the Eagle F1 GS tires for drivers of sports cars, trucks and even older muscle cars who want an aggressive tread design to along with predictable wet and dry pavement performance. Goodyear tires does not have a tread life guarantee on the Eagle F1 GS tire. However, they do provide a 6-month or first 2/32 inch of wear on the tire’s uniformity. A 6-year guarantee on materials and workmanship also applies, which includes a free first year replacement or the first 2/32 inch of wear, followed up with a prorated amount on remaining tread down to the final 2/32 inch of useable life.